It’s undeniable that fish is an essential part of a healthy diet. Packed with heart-healthy fats and omega-3s that support sharper brain function, the American Heart Association recommends eating two servings of fish per week — a recommendation that I don’t come even close to meeting. You see, fresh fish is one of those things we just never ate growing up. Consequently, I very rarely prepare it for my own family. I mean, I know my way around a kitchen, but cooking fresh fish is simply out of my comfort zone… But I’m making a concerted effort to change this. So there was one thing that threw me for a bit of a loop — removing the salmon pin bones. Pin bones are tiny bones that you’ll find in almost all wild-caught Alaska salmon. 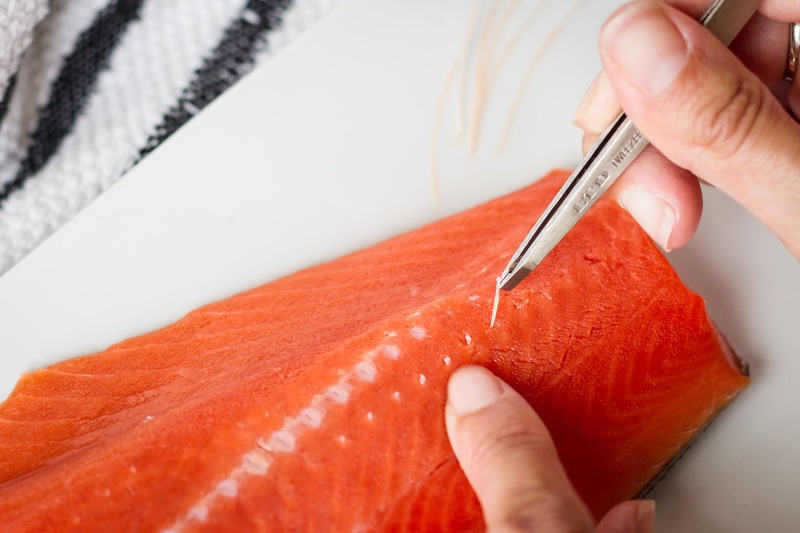 Because the salmon is caught, processed, and flash frozen to lock in quality and freshness ASAP after being caught, the fisherman typically don’t take the time to remove them. Removing the pin bones can be a bit tedious, so this allows the fish to be processed much more quickly, meaning your salmon is super duper fresh. Honestly, I wouldn’t even bother with removing them, unless you have very young children. The bones are very easy to spot and remove while eating. But if you do want to remove them before cooking, you’ll just need a pair of tweezers or pliers to gently slide them out of your uncooked salmon fillet. I love, LOVE this simple grilled salmon in foil recipe because it provides dinner and a side in under 30 minutes! I really wish I’d learned sooner how easy grilling salmon in tin foil is. And my kids are crazy about it, so that makes it a double win! Add some fresh cut seasonal fruit or a simple side salad, and it’s one of the easiest dinners EVER to prepare. I feel kind of foolish for feeling so apprehensive about preparing salmon at home for all these years. 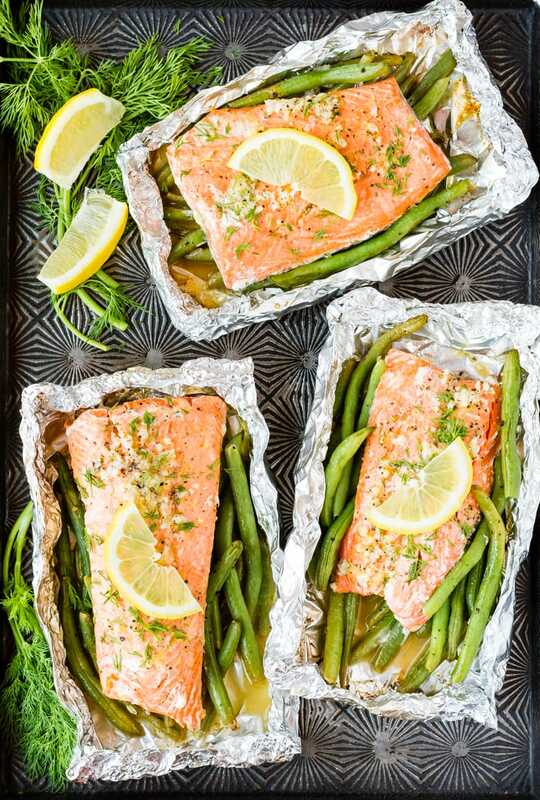 How To Grill Salmon In Foil? Ready to learn how to grill salmon in foil? It starts with tossing a pound of fresh green beans with a little extra virgin olive oil. 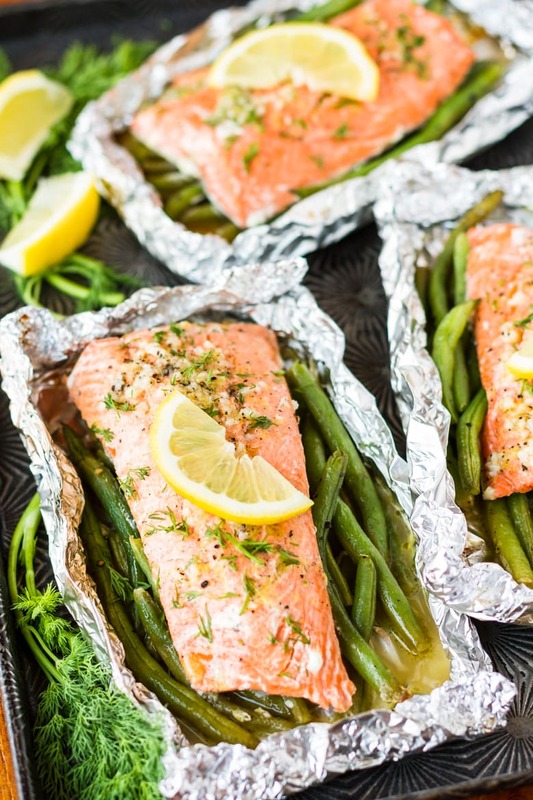 No need to prepare additional salmon side dishes with these salmon foil packets! They’re the perfect all-in-one dinner solution. Season the green beans with a little salt and pepper, and then divide them among four large squares of heavy duty aluminum foil. Top each pile of green beans with a 6-oz. Alaska salmon fillet. Next we’ll whisk together a mixture of melted butter, lemon zest, fresh lemon juice, minced garlic, salt, and freshly ground black pepper. Pour this mixture over top of each piece of salmon. Then pull the edges of the foil together and fold and scrunch to seal each into a compact foil packet. How Long To Grill Salmon In Foil? How long to grill salmon in foil will vary by the size of the fillet, but a good estimate is about 14 minutes, flipping once. When the salmon flakes easily, you’ll know it’s ready to serve — easy as can be! When cooking salmon on the grill in foil, I like to drizzle a little extra butter over top of each piece before serving. And make sure to season each fillet with a little additional salt and pepper. You can also add a little chopped fresh dill and lemon wedges as a garnish. Both are optional, but it’s a fabulous way to add some extra appeal for a dinner party! PIN IT NOW! 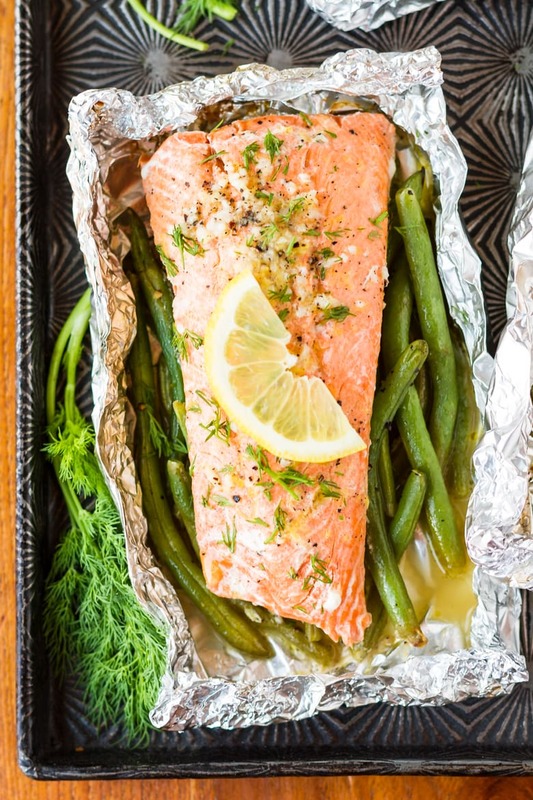 CLICK HERE TO ADD THIS GRILLED SALMON IN FOIL TO YOUR GRILLING RECIPES BOARD ON PINTEREST! Cut four pieces of heavy duty aluminum foil into 14-inch lengths. Toss green beans with 2 teaspoons olive oil and season with salt and pepper to taste. Divide into four portions and layer in center of each piece of foil. 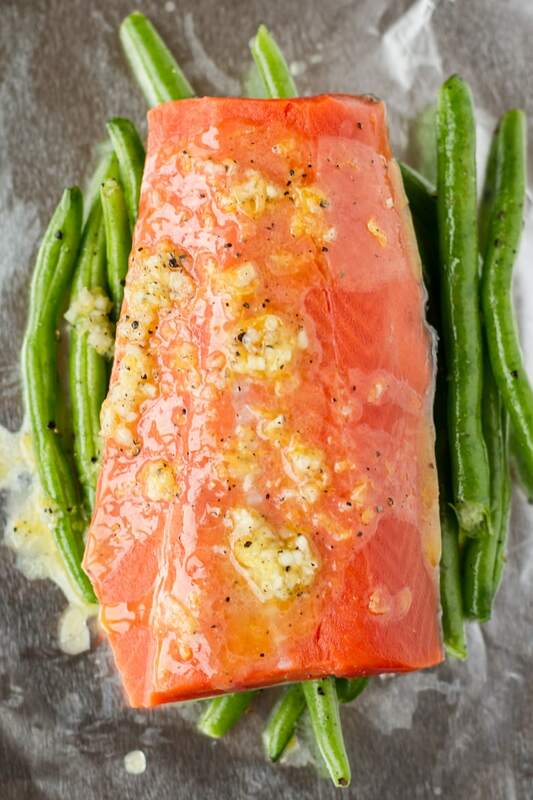 Place a salmon fillet on top of each pile of green beans. In a small bowl, add melted butter, lemon juice, lemon zest, garlic, salt, and pepper. Whisk everything together, and pour over each piece of salmon. Pull the foil edges together and scrunch them up to seal each packet. To grill these packets: Preheat the grill to medium-low heat and place the packets directly on the grill. Close the grill cover and cook for 13-16 minutes (or until the salmon is cooked through and flakes easily), making sure to rotate the packets 1/2 turn about 7 minutes into the cooking time. 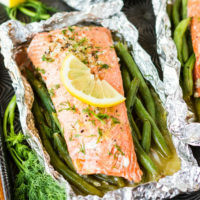 To bake these packets: Place side by side on a baking sheet and bake in an oven preheated to 400 degrees until salmon has cooked through and flakes easily, about 20-25 minutes. Carefully unwrap each packet before serving. Season with additional salt and pepper to taste. Sprinkle with chopped fresh dill, if desired, and garnish with lemon wedges. Parsley & Garlic-Rubbed Sheet Pan Salmon With Asparagus And Potatoes — This parsley and garlic-rubbed oven baked salmon recipe is sure to become your new favorite… Makes a main dish + 2 sides with just one pan to clean up! I’d love to see how your grilled salmon in foil turns out… Tag me @Unsophisticook on Instagram or use the hashtag #Unsophisticook so I can check it out. Enjoy! Love this super easy and tasty recipe! This looks so healthy & flavorful!! Can’t wait to make it!! Thank you so much for showing how to remove the bones!!! I’ve always been so intimidated by this! Lol! This look so delicious! I love to grill in foil packs!!! Have to try this next. Wow, I found a very important information for me, how to remove pin bones from salmon. Thanks for the info and also thank you for sharing the recipe, I can’t wait to do it! Salmon is one of my favorites. I love how you added a few tips to remove those tiny bones. I can’t wait to make this one night. 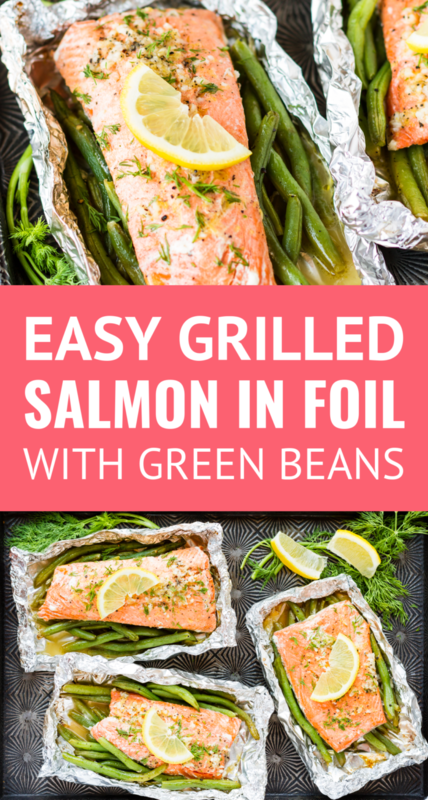 Love the ease of cooking in foil and since I’m a huge salmon fan, I will definitely be giving this recipe a try! I love packet foods! The salmon looks delicious and this would make for such a great weeknight dinner. I can’t but help smile when I see fine beans. My wee boy tries to open them like fresh pea pods. Every time, no matter how many times I tell him you eat them whole. Terrific photos. These salmon foil packs look amazing! Perfect for summer dinners. I love salmon and I can tell just by looking at this photo this is bursting with fresh flavors. Lemon really perks it up! I’m missing the instructions on how to make this a freezer meal. Would this work for a whole fillet? Same cooking time baked. Yes, it will work. The cooking time should be similar — just check to see that it flakes easily, and you’ll know it’s done. Thanks, Stephanie — so happy to hear you loved it!